Sx2 Dongle from Maintronic for Bosch Gen2 engines.. The Sx2 dongle is a well-known E Bike tuning tool that enables you to drive twice as fast with full motor support. A big advantage of this tuning tool is the very easy installation. At first, you have to connect the device in a few steps parallel to the speed sensor (the Sx2 dongle is integrated into a compact, pluggable 3,5 mm jack plug). After that, you can activate or deactivate the tuning within a few seconds by attaching or pulling off the dongle (“plug & drive”). If the Sx2 dongle has been plugged in, the tuning will be activated automatically between speeds of 13 to 25 km/h. After that, you can drive up to 50 km/h (about 32 mph) with the engine power still assisting! Please note: When the tuning is activated, the speedometer shows only half of the actual speed. If you want to cancel the tuning, simply pull off the dongle – get legally in 2 seconds! Now the engine support stops at 25 km/h and you can drive legally on public roads again. Manufactured by the German company Maintronic. 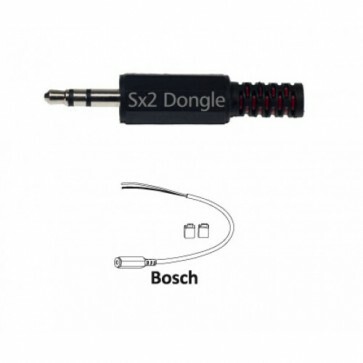 The Sx2 dongle comes with a cable kit especially for Bosch Active, Performance & CX Line engines. Please do not forget to indicate the wheel diameter of your electric bike when ordering! Hint: You got the option to choose the “Sx2 Dongle for Bosch with Power Switch”, too. The “power switch” enables you to turn the Sx2 dongle on or off conveniently via the light switch. “Here”.